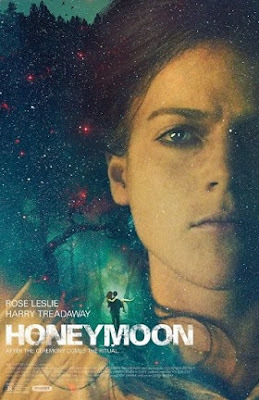 In Leigh Janiak's 2014 directorial debut, Honeymoon, newlyweds Bea and Paul are indeed taking their honeymyoon at a secluded lakeside cottage. All is going well until Paul wakes up late one night to find Bea has gone missing. He finds her naked in the woods and after that night, she begins to act strangely. As ger behavior continues to get more erratic, Paul has to figure out if he is going crazy or if someone (or something) is impersonating his wife. Janiak makes an interesting decision to have this mysterious affliction affect Bea, but to have the story take place through Paul's perspective. Paul doesn't know what's going on with Bea, and he only catches glimpses of her deterioration in the middle of particular episodes. He starts taking stabs in the dark to try and find out what's going on, even asking at one point he asks her if she's having an affair with a childhood friend. As it becomes clear that this is not the issue, and the problem is much scarier, Paul's downward spiral is just as dramatic as Bea's. At least, this is the case psychologically. Physically, however, Bea is the one getting the short end of the stick, as this flick takes body horror into some seriously unsettling territory. The gore in this movie is used sparsely, but when it is utilized it cracks you in the head like a baseball bat. I won't give away the climax here suffice to say that it will be horrifying for anyone with lady parts or anyone with an appreciation for lady parts. Honeymoon was particularly creepy for me because it was easy for me to imagine how off-putting it would be for me to be in this situation. I've been with the same person for more than a decade, so to imagine her suddenly becoming another person is chilling. Sure, we like our significant others to surprise us once in a while, but I think we're usually thinking more along the lines of finding out they secretly like a band they always said they hated, or that they're thinking about getting a tattoo. To find out that thing has fundamentally changed in your relationship can be terrifying, whether or not it's due to something paranormal.